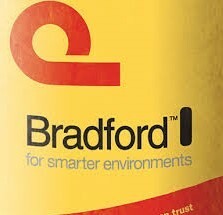 Bradford MultitelTM is a low density lightweight insulation used for externally wrapping HVAC duct work. Bradford MultitelTM is manufactured from an engineered glasswool insulation blanket typically faced with a reinforced foil. The blanket is manufactured by spinning molten glass, containing up to 65% recycled content, into fine wool like fibres. These are bonded together using a thermosetting resin. The product can be identified by its golden appearance.